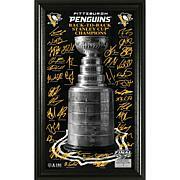 Featured in a 12” x 20” wood frame are the facsimile (exact replica) signatures of the 2017 Stanley Cup Champions over an image of the team huddled around the Stanley Cup following their victory and showcased on a 10” x 18” glossy image. Protected under glass, this item is a limited edition of only 5,000. Each photo is individually hand numbered and a certificate of authenticity is adhered to the back of each frame. It is officially licensed by the NHL and NHLPA. Proudly made in the U.S.A. by The Highland Mint!